It was another fairly quiet month from a sycophancy perspective, with just six points scored all month. From the start-of-the-month perspective, it was promising, with Tom Marshall putting one in on the first day. But then, from a things-slowing-down perspective, it was over a week before the second goal, courtesy Ross Wiseman. It looked like a things-picking-up perspective when Joan Burke nailed one the following day, but it would then be almost two weeks, from a quiet perspective, before she would get the next one in, her second for the month. From a false-hope perspective, Dianne Whalen knocked in another the next day, but the month ended up on an out-with-a-whimper perspective, as the only other score was Dave Denine’s on October 27th. It’s a good thing, from a scorekeeping perspective, that Burke got that second, because every point this month was scored unassisted, with nothing to fall back on as a tie-breaker. So, from a back-to-back victory perspective, resuming the dominance she displayed from a September 2007 to April 2008 inclusive perspective, your October sycophant of the month is again Joan Burke. Congratulations! What really infuriated me — and I’m back on the spin doctor theme now — is how during the election, Conservative candidates in this province played the “Oh, gee, if you don’t elect one of us, you’re going to be really screwed” card. Was she equally infuriated, back in 2007, when Danny and His Minions played the same card? Elizabeth Matthews: …we get a crisis in our office every week, sometimes several times a week, and it turns out, after the act, upon reflection, with more information, to be significantly diminished. So that's just the nature of how our office works. Brian Crawley: The office receives, over the run of a year, anywhere from 125,000 to 150,000 contacts, so it's an incredibly busy place to work from the time you get there to the time you leave, and then some. In addition to Cabinet Secretariat, the Premier is also very active on a national level in matters of intergovernmental affairs, so he would, I think, last year, have received well in excess of 400 submissions from the Intergovernmental Affairs Secretariat ; that would be used to prep him for any issue should he decide to participate in on a national level. And he is quite active on that front, so again, that's a fairly busy place. So much information comes into the Premier's office. It's an incredibly busy place to work. The environment there is unlike anywhere that I've ever worked before, and you know, I think most people would be quite shocked by the actual volume of work that goes through there. Danny Williams: Christine indicated to me that she cleared out that week — not cleared out, cleared the deck that week and was not in that week, which tells me, and she said it to me, I didn't say it to her, that in fact that indicates that that was one of those weeks in the summer when you tried to leave as much open as you could, because during the summer, apart from the Premier's Conference, like I try to spend as much time as I can in Newfoundland and Labrador for obvious reasons, depending on what weeks, what weather weeks you strike. So I tried to keep some flexibility, and normally what I try to do on a week like that is certainly keep the book ends, which I would say would be Monday and Friday, and then because of demands for things like you see, the Hebron briefing and other appointments, I will book a day in the middle of the week and kind of stack that up and then leave the others open. So that if it happens to be free and the weather happens to be good and I can grab a couple of days in the summer, then I will do that. I do know, after having talked to her and my staff, that in fact we were preparing for the New England Governors' Conference, which was a big thing for me then. It was in the early stages of being Premier, and that was something that I had to prepare for. The Hebron briefing, as you can see, was there as well. So the only other duty on that particular day, on the Tuesday, which I was committed to was a swearing in ceremony for Clayton Forsey. So that was at 11:00, so assume in the 10:40 to 11:00 range, I would have gone to Government House. That's the best reconstruction of that week. So it's very likely, and I can't say for sure because I don't remember, Monday and Tuesday and perhaps Monday and Thursday and Friday and perhaps Tuesday afternoon, I wasn't even in the office. But that doesn't mean that I was out of contact, because any day that I am not in the office, I am always in constant communication. Either my staff will contact me or I will contact them and the only exception to that rule is once in a blue moon, if I happen to be in a remote area, like a salmon river, for example, that has no contact. I actually — you know, I have e-mail set up, but I'm — ashamed to say, I'm not an e-mail user. Then… then… this must mean that someone has hacked into ODP’s email account! Someone call the RNC, quick! So there was a heavy onus on ministers because they had multiple duties, but, you know, there was what I would term an open relationship between us in the sense of, you know, if you need to come to us, come to us, and when we need to go to you, we'll go to you, from a big picture perspective. I got to tell you from my own perspective, the detailed systems in the office is not something that I would get involved in, rightly or wrongly. That may be an abdication of responsibility, however, you know, from an office setup perspective, that's just not somewhere where I'd be involved deeply. Now given the number of contacts, as I said, the hundred thousand plus contacts that come into the office, obviously people on the eighth floor are making decisions on a daily basis as to what moves forward and what doesn't move forward, and that's at every level, from our receptionist who gets inundated with calls, depending on what the issue of the day or the issue of the month is, that person alone receives a lot of frontline compliments and attack from both perspectives. From a budgetary perspective, and a health care perspective particularly, you know, I remember sitting around the table and having to decide on teeth and glasses for people, some of the basic necessities of life so that people could see and eat, and having representation made to us by good people who are involved in the budget process that had to put everything before us and saying to us these are the kind of decisions that you have to make, Cabinet, and you have to prioritize them. The Department works it out, and then it moves on and it's never seen or heard from again, from our perspective. Based on that, that is a clear signal to our office that this matter is, for want of a better term, dormant right now in the sense from our perspective, we're not required to be involved and it is now in the hands of health officials, whether that happened to be the Department of Health or Eastern Health. Well, you know, I guess, Mr. Coffey, if you look now as the result of the experience of what we've all gone through, you know, I can tell you right now that all senior officials are on red alert and that means from a perspective of, you know, major matters. Ministers have been now told categorically in a Cabinet meeting that if there's matters of important that, you know, need my attention and they need me involved and they affect the people in this province in a major way, whether that happens to be life safety or whatever else, then you need to come to me directly and you need to let me know directly. From my own personal perspective, if there's something wrong, I'd like to know at the earliest available opportunity. Certainly Mr. Forsey and his family, other MHAs, possible some Cabinet Ministers and I'm not doing that from memory, I'm just saying the type of nature, Lieutenant Governor and staff would have probably been — from a media perspective, it would have been Ms. Matthews and then possibly from a staff perspective, either Mr. Dinn or Mr. Noel who was with us at the time, if I remember correctly, yes. The issue was minimized which is the term that was used, not in that context, but the term was used, so therefore, it may not be something that any members of my staff may have considered, you know, an issue to put before me at that particular point in time and, you know, again, that's from the perspective of the patients. The big thing for us from a public perspective would be that the matter is under control, that the patients are fully informed, that they are being notified, that the damage has been controlled, and that they're basically trying to get to the bottom of it and come up with the answers for people. Now at this particular point in time, I don't know if the ads were going out or when they went out, but there was a reassurance given to us then that this was very much under control, and people who needed to know, knew, and people who needed to be involved from an expert perspective were being very much involved. I think from our own perspective, our own Ministers and officials were saying to Eastern Health, "let us know what you need from a resource perspective to resource up to get answers" and I think that was done, certainly told it was done and I assumed it was being done. With regard to something like Herceptin, you know, when that drug or a suggestion is made from a pharmaceutical perspective as to what drugs are appropriate, that comes on recommendation, I think, if I remember correctly, from a panel of doctors or specialists who say to us, you know, this has been accepted by the appropriate agencies across the country or North America. This kind of information though, you know, from the patient's perspective and people affected and, you know, this is important information on the way through that should be passed on to people who have an ability to probably do something about it. Reading that, you would assume that the reviews are still ongoing, retesting is still going on at Mount Sinai, this is taking longer than it was expected to take, however, for me I wouldn't question that because if the process is taking longer, the last thing, I suppose, from a legal — from a medical perspective that people should do is fast track that process. So it wouldn't have been my issue, put it that way, in that perspective. Be from a co-ordination perspective, so that if this came out of left field in the House, so that I wouldn't just be hit between the two eyes and say, okay, there's an issue here that I'm not aware of, and I would be able to say in my own mind that I've looked to the Minister of Health and Tom would get up and handle that question. And I just basically said yes and, so you know, from a disclosure perspective, Madam Commissioner, I don't know where procedurally we could ever go with this. In the criminal side there's disclosure requirements, but on the civil side, certainly from a public body perspective, you know, we wonder whether there should be more open disclosure because it's difficult to get it, but I do have to speak from a position where, like I can do it because, you know, I then have to answer to my Cabinet, but I know my Cabinet feels that, you know, information that's important in the public domain should be disclosed and that's an openness. Now before you leave that though, if there was an area where I think we dropped the ball from a government perspective, it's there and the reason being is that the Department Health should have and/or knew the figures, the minister was briefed prior to that. I believe the minister was briefed in November. So I suppose from a patient perspective, at least people who had their treatments changed, that was disclosed. Yeah, and I mean, you know, from the minister's perspective, and I go back to the August briefing note, in fairness to Minister Osborne, he did not have that briefing note. Well, it would be concern, I mean, just basically that he is concerned about what is going on over at Eastern Health from the perspective of, you know, information being provided, and again in his role as minister, he is responsible for that public confidence side. No, just, you know, really a more just gearing up and trying to put information together as best we can and pulling together whatever records would be available from a briefing note perspective, what information I have, what information others have. Talked about communications issues, and then there was a discussion on quality assurance, but what we did do was go through a chronology as to what happened from the start, what we had from a briefing note perspective, you know, what ministers knew and what ministers didn't know, and that was an issue, and everybody was brought up to speed. First of all, from an adverse health perspective, on this event, also on a go - forward basis on major adverse health events, and also as probably the best person in government to be able to liaise with this Inquiry in order to produce and provide accurate information, and that's been a tough process, not because he hasn't been doing it right, it's because it's been difficult trying to get all the information due to database management issues and pitfalls and poor record keeping, and these are — you know, these are after the fact situations. It's, you know, the problem, how it happened, when it happened and then when we move into damage control mode, and there are two completely different scenarios that are probably pretty clearly delineated from a time perspective, you know, and a lot of emphasis has been put on who did what after the fact. The Minister of Tourism, Culture and Recreation, Clyde Jackman, says the majority of letters and comments he gets about Marine Atlantic are negative and far outnumber the positive comments. Jackman told VOCM Back Talk with Bill Rowe, the criticism comes from both visitors and residents. The Minister says he spoke with two tourists from Milwaukee this past summer. He says they told him their experience was unbelievably poor. Jackman says he wants to maintain the lines of communication with the crown corporation. He hopes to get together with Marine Atlantic soon. The Minister says despite all the cost increases over the past year, the province has held its own when it comes to tourism. Meanwhile, how are the letters and comments running about the Labrador ferry service and Labrador highway, Clyde? Did the radio host bother to ask? So you've got to provide infrastructure, so you need the bricks and the mortar. Then you have to make sure that you can retain competent professionals to the best of your ability bearing in mind that you're competing with Alberta and Saskatchewan and Ontario. So you have to strike that balance , but then — that's the balance you strike in health care. No, it's not a headline out of the comms shop. 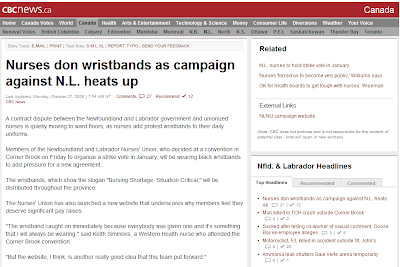 Not even the comms shop would be so black-and-white-and-crass as to claim that the nurses are campaigning "against N.L."... would they? Not only is Danny Williams beating up on the little kids, he’s also stealing their lunch money. Why? There’s some apparent psychological need to squash any voice that might oppose his dominance of Newfoundland and Labrador. In his reign, Mr. Williams and his radio talk show thugs have attacked journalists, business organizations, judges, bloggers, federal MPs, union leaders and now a few powerless opposition members who pose no threat. For that matter, where's the Globe and Mail? For that matter, where's the Telegram? or the local plant of the Ceeb? The premier has said he will make finding a full-time fisheries minister a priority. Trevor Taylor has been acting in that role ever since Tom Rideout resigned last May. I can’t stand generalizations or general accusations against people. - Radio host No Names Please, Thursday afternoon. Danny Williams-Government wants teachers to work on snow days. Which would be a reasonable enough proposition — if Danny Williams-Government showed up to work on snow days itself. Yes, this means you, Maude Barlow. Why do native English speakers who would never, while speaking English, say Suomi or Miṣr or Bhārat or Magyarország or Nihon or Zhōnghuá or Sakartvelo or Hayastan or Österreich or Ellás, yet insist on pronouncing "Nicaragua" like Donald Duck hacking up a half-swallowed chunk of chaw? Premier Danny Williams says he would be very surprised if nurses went on strike. Government and the union are caught in a contract dispute, with the nurses set to decide their next action during their convention in Corner Brook this week. They are already refusing to perform some of what they consider non-nursing tasks in health care facilities. Meantime, government has launched an ad campaign, reiterating its position. Premier Williams suggests not only nurses, but NAPE as well, take the 21.5 percent compounded increase over four years now, because uncertain times could be on the horizon. The premier says government is now facing a situation where the price of oil has dropped in half. He says from a union perspective they should be delighted and grab this offer now and be secure. Ah, for the simpler times when it was, y'know, up to a union to determine what is, or is not, a "union perspective". You have to wonder... if Minister Joan Burke is so very concerned, wearing her Minister Joan Burke hat, about "taxpayers expenditures" and "days of excess"... then why is this press release, identical in style and tone to a zillion others issued during the Danny Williams-Government years, published to The Party website, and not the Danny Williams-Government one? The Honourable Joan Burke, Minister of Education, MHA for St. George's - Stephenville East and Government House leader today responded to unwarranted accusations by the Leader of the Official Opposition that the House of Assembly Management Commission is ineffective. "Nothing could be further from the truth," said Minister Burke. "In fact, decisions like those made today underscore the purpose of the Management Commission which is to ensure that decisions made regarding taxpayers expenditures on Members of the House of Assembly are done with great thought and consideration. The Commission is not just a rubber stamp to hand out money to the opposition parties. The people of the province expect more than that; they expect better of their politicians." Today, the Commission discussed the recommendations of an independent study on levels of expenses for each of the caucuses in the House of Assembly. Following the last Provincial General Election, it was agreed by all parties that the Liberal and NDP Caucuses would receive an additional $100,000 in base funding pending this report. Minister Burke says base funding for caucuses should be equal, and whereas the government caucus did not receive additional funding after the provincial election it should receive it now. This is a practice followed in other jurisdictions such as Saskatchewan and Nova Scotia. "When you look at the number of caucus members for each party and the corresponding allocation of monies, it is clear that the Liberal party is most certainly not being disadvantaged," added Minister Burke. "For Ms. Jones to complain about lack of funding is extremely unwarranted. The days of excess in the House of Assembly are over." The Minister also pointed that while Ms. Jones is quick to point to the report of Chief Justice Green and his recommendation that caucus resources were to be reviewed, she failed to acknowledge that her caucus has already been the recipient of a large increase since the last Provincial General Election. "Chief Justice Green said the situation should be reviewed. It has been reviewed and under our recommendations the Official Opposition will receive $111, 600 more than the allocation formula that was in place after the last provincial election, even though they have substantially fewer seats. Government caucuses have a right to equal base funding as opposition caucuses," added the Minister. "They do no have departments or public workers at their disposal and they deserve equal treatment. Ms. Jones must answer why her caucus deserves more money than everyone else who were equally elected to represent the people of their districts. Each and every district and individual in this province should be equal." The House of Assembly Management Commission will reconvene in the coming weeks to make a final decision. Interesting choice of capitalization, there, guys. Read snarky political blogs much? ST. JOHN'S (NL) - Members of the Progressive Conservative Party of Newfoundland and Labrador (PC Party) are preparing to hold their Annual General Meeting (AGM) in Corner Brook this weekend, October 17-19 2008. "This is the first AGM since our decisive General Election victory just over a year ago, and our two by-election victories in August," said PC Party President, John Babb. "This will be a great and hard-earned weekend for the Party faithful to come together to celebrate our successes, and to do the important work of the Party." This is the PC Party's 57th AGM. With it, comes a full agenda including reports, presentations, resolutions, along with the Annual General Meetings of the PC Women's Association and Young Progressive Conservatives of Newfoundland and Labrador. The Honourable Danny Williams, Premier of Newfoundland and Labrador, will give the Keynote Address on Saturday evening. "With the tremendous, sustained popularity of our Leader and our Party, coupled with the unprecedented success we have been experiencing in this province, these are indeed exciting times for our Party and the province as a whole," added Mr. Babb. "This weekend will allow our dedicated team of Progressive Conservatives to re-group, re-energize and focus on the job ahead - developing and implementing policies and plans for the advancement of our great province." Review of Caucus Resources – House of Assembly. The report was finally released on October 15th. That's only 51 days later. Who knows, maybe Danny Williams-Government will yet, perhaps accidentally, meet its self-imposed 30-day guarantee. No, but apparently it's a rubber stamp to hand out money to The Governing Party. And way to mindlessly parrot Our Dear Catchphrase, Joan and Donna. The more you deny it, especially with that eight seven-word string, the truer it looks. A new provincial fisheries minister will be appointed soon.Premier Danny Williams gave that indication over the weekend at the provincial Progressive Conservative Party Convention in Corner Brook. Trevor Taylor has been the acting minister since Tom Rideout's resignation in May. There may be other changes too. Williams says expect the announcement within two weeks. He says the federal election and the Innu negotiations have kept government pre-occupied. Premier Danny Williams says today he is extremely proud to be a Newfoundlander and Labradorian, but as far as he's concerned he's putting the Harper record behind him. Williams says he's proud of this province for recognizing the potential of a Harper majority, and although the Prime Minister has been quoted as saying he didn't need this province to get elected, our 7 seats would have certainly been needed to form a majority. Why the passive? "Has been quoted" by whom? Tom Marshall, Minister of In-Migration, was so pleased with last week’s press release congratulating the provincial population for growing that it's been top news now on Williams Government's website for a week. Anyway... Last week this time, Mr. In-Migration Minister was delighted, claiming on VOCM radio that "people are comin’ back for good payin’ jobs." Demographic technical discussion alert: There are four factors which determine the population change of any area over any given time. They are births, deaths, in-migration, and out-migration. However, when you are talking about individual age-cohorts of that population, other than a cohort whose lower age limit is birth, there are only three factors — death and the two migrations. Obviously, no one is born age 36. However, over time people do, if they still live in an area, pass out of one age bracket and into another. Perhaps the good Minister hasn’t bothered to check other stats, supplied by the same agency, Statscan, which provided the good news on the net-inmigration front. Statscan very helpfully breaks down the labour force population into five-year age cohorts. 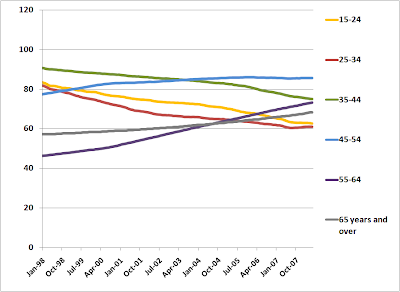 The following graph shows trends in the estimated population of Newfoundland and Labrador, by age, for the past decade. (Children under the age of 15 are not included.) For the purposes of visual cleanliness, the data has been aggregated to reduce the number of series, into age cohorts of ten years starting at age 15, 25, 35, 45, and 55, with everyone 65 and over combined into one big cohort. Remember, these age cohorts grow through natural aging or through in-migration, and decline through death and out-migration. So who are all these "people [who] are comin’ back for good payin’ jobs"? Well, if they are people just starting their post-secondary education and early careers (15-24); or people just hitting their career strides (35-44), if they are comin’ back for good payin’ jobs, then they are still not filling the numerous posts that must be left behind by the vast numbers of healthy young people who must, mathematically, be dying. Both of those cohorts are showing continued decline; and while the younger of those two brackets is showing slower decline of late, the 35-44 bracket has actually seen accellerated decline in the past two or three years. This, of course, has nothing to do with Danny Williams-Government, which only has jurisdiction over population growth. Even the later-career bracket of 45-54 year olds has flatlined, and having threatened to start declining, has lately sputtered to at best, or worst, a kind of stasis. The only real sign of population growth among people still thinking more about their careers than about their retirements is a levelling out, and slight gain, in the 25-34 year bracket. Populations of the Freedom 55 set and technical senior citizens are continuing to grow, with signs of accelleration, due largely to the "baby boom" working its way through the population pyramid. If any of that population growth is due to in-migration — and there are some other signs that it may be — then those aren’t people [who] are comin’ back for good payin’ jobs. They are people [who] are comin’ back for good payin’ retirements... and, possibly, comin’ back from good payin’ jobs. 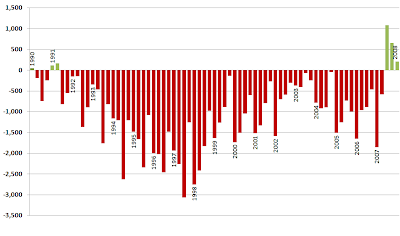 As noted previously, past bouts of in-migration have tended to be harbingers of recession. ... they ran it twice. We Newfoundlanders and Labradorians are never all that pleased with our options on the federal ballot. There are no angels. Still, I expect parties to show basic respect for our way of life, our heritage and our industries. If they can't manage that, they don't deserve my vote. Now there's talk of a federal election. Folks out in the Confederation building in St. John's have been telling us how to vote. We're used to that routine. They should know by now that nobody's going to tell us what to do. It's our call. That's how democracy works. When you actually say "NewfoundlandLabrador", and especially when you start negotiating public-sector union contracts on air, you might as well start rustling the paper you're reading off. The NB branch plant of the Ministry of Truth (federal), and the NB provincial opposition, see right through the logic in Shawn Graham's plan to make his province more self-sufficient by increasing its dependence on Ottawa. Is there any particular reason why the CBC across the province of St. John's, and the provincial opposition, is unable or unwilling to connect the same dots with regards to Danny Williams' Glorious National Plan For National Autonomy of the Nation Through Increased Federal Transfer Payments, Federal Cost-Sharing and Program Spending, and Federal Civil Service Presence? New Brunswick Premier Shawn Graham has written an open letter to all five federal party leaders, asking them to endorse his province's plan to become more self-sufficient. In the letter, the premier said becoming less dependent on the federal government by 2026 involves Ottawa doing more, such as: spending more on child care, building more roads and putting more federal jobs in the province. Meanwhile, the provincial Tories said Graham is sending a mixed message, trying to be more self-sufficient while asking Ottawa for more money. Leader Jeannot Volpe said New Brunswick has been getting more money from Ottawa, but Graham's Liberal government hasn't learned to live within its means. The massive Bloom Lake iron ore mine project near Labrador City / Wabush is on budget and on schedule to begin production in eleven months time. Consolidated Thompson president Richard Quesnel says they are in the process of raising the additional $100-million dollars required to meet their start up date. Consolidated Thompson recently increased planned production from seven to eight million tonnes which will mean an additional $80-million dollars U-S in annual revenues. Bloom Lake is about twenty kilometres east of Lab City / Wabush. If by "east" you mean "west", yeah. On the Quebec side. Williams has shown no signs of backing down on his own ABC campaign. Over the weekend, ads were purchased in weekend newspapers. Our fight is not with Canada, not at all. No, Tom, to the extent that Our Dear Fight isn't with Fabian Manning, Our Dear Premier sends out plenty of dog-whistles today that Our Dear Fight is, in fact, with "Canada". Newfoundland and Labrador’s population has increased by 1,436 from July 1, 2007 to July 1, 2008, representing the province’s first annual population increase in 16 years, said the Honourable Tom Marshall, Minister of Finance and President of Treasury Board. According to Statistics Canada’s Demography Estimates, released on September 29, Newfoundland and Labrador’s population grew by 0.3 per cent to 507,895, as a result of positive net-migration of 1,713 people. Mkay. Take at face value his assertion that developments started before his government came to power (Voisey's Bay, Hibernia, White Rose); before Confederation (Labrador West's iron ore industry; held up by his government (Long Harbour, offshore expansion); or entirely hypothetical ("potential expansion", "on the horizon", "Lower Churchill") are drawing them back. Bringing them home. Every mother's son. Etc. In short, Marshall believes his own bumpf, and ODP's airport thronged with hundreds of imaginary arrivals, and truly thinks that his government's statism and jingoism are really responsible for the late spate of net-inmigration. In other words, Marshall believes that Danny Williams is responsible, through the phenomenon that the gullible call the "Williams Effect" (ooh - band name!) for provincial population trends. At least when they are favourable to the Williams Government narrative. But surely to goodness, if demographics are so driven by provincial government policy, then the first term of Danny Williams-Government, during which net-outmigration was accellerating, must also be the product of, how you say, the Antiwilliams Effect... right? If Danny Williams-Government must be credited with net in-migration, then he also has to be debited for the nearly four years of net out-migration that happened, how you say, on his watch. Because, as this graph of quarterly net inteprovincial migration shows, that is exactly what happened to the province's demographics. Where were Tom Marshall and his crack team of statisticians and press-release writers then? The Williams administration says its promised policy of making all government-commissioned reports public within 30 days of their completion remains in effect, despite some recent exceptions. Officials in the premier's office said the government is now reviewing its files to see what other unreleased reports may be gathering dust. Last night on the Ministry of Truth, Jerome! Kennedy! said that Sooper Sekrit report on HM Pen will be released in 30 days, “according to policy”. Kennedy said he will make the report public after announcing more changes arising from it, which could take months. It may not be busting rocks, but inmates at Her Majesty's Penitentiary may be forced to pick up mop and bucket as part of the daily grind. Justice Minister Jerome Kennedy is reviewing a wide sweeping report which contains some 77 recommendations on how to improve prison life at HMP. The minister began yesterday by changing at the top, dismissing John Scoville as superintendent and promoting Graham Rogerson to acting superintendent. On VOCM Open Line this morning, Kennedy suggested inmates in St.John's may soon be responsible for keeping it clean. Kennedy is also concerned about a situation where correctional officers who are suspended forego their pay while other uniformed personnel, such as police officers, continue to be paid while on suspension. Kennedy is going to bring together many organizations with an interest in prison conditions next week to talk about the report. The minister says that document, entitled "Decades of Darkness: Moving Toward the Light" will be made public within 90 days. But... but... but… Elizabeth Matthews — 729-3960, elizabethmatthews@gov.nl.ca — said, in March, that the 30-day policy is still in effect. Surely, surely, surely to goodness, Elizabeth Matthews — 729-3960, elizabethmatthews@gov.nl.ca — can provide a copy of that policy. And maybe the Telegram, or some other media outlet, could publish that policy for Jerome!’s benefit. In a totally unrelated development, other than also having Jerome! Kennedy!’s name attached to it, this is Right to Know Week. September was the first month since May in which at least one Williams Government release went out in every week, percing the droocht of sommer to the roote. Joan Burke was first up on the board, on September 4th, also her first goal since May. Recent defending champs Dianne Whalen and Dave Denine quickly got themselves up as well, but Burke knocked in three in quick succession between September 11th and 15th. On her last goal she was assisted by Jerome Kennedy, who put one of his own in the net on the 26th – also his first since May. Kevin O’Brien finished out the month with his first since April, and only his second ever, crediting Danny Williams-Government for the sweet taste of the water or some such. So with four to her name, as many as the rest put together, Joan Burke takes the monthly title for the first time since her eight-month streak ended in April. Congratulations, Joan! "This is exciting news for our province and is reflective of the renewed confidence that exists among Newfoundlanders and Labradorians here and abroad," said Minister Marshall. We're actually looking at going east and south [with transmission lines], which means we're going to come across Labrador. We'll keep power in Labrador for adjacency purposes if there's industry available there, whether that happens to be an aluminum smelter or some other type of industry, then we'll take that power on down to the island, and we'll clean up the dirty emissions that we have coming from the Seal Cove generation facility. And what would be the locational advantage for said hypothetical industry to locate in Labrador if the same electrical power were made available in Newfoundland — especially southern, ice-free, Newfoundland? This is the second condition that ODP is musing about that would have to be satisfied before Labrador could actually tap into Labrador's own energy resource, "for adjacency purposes" or otherwise. • committment of funds and legislative and regulatory measures to develop a truly national electricity transmission system, in particular funding for transmission in Labrador, to Newfoundland, and, if necessary, to the Maritimes?